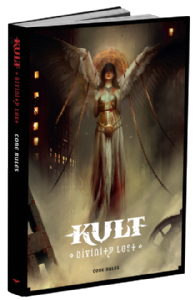 KULT: Divinity Lost is a reboot of the highly acclaimed and infamous contemporary horror role-playing game “Kult”, originally released in 1991. This, the 4th edition of Kult, features a completely new rule-set, and the setting is updated to present day. Escape your nightmares, strike bargains with demons, and try to stay alive in a world full of pain, torture, and death. The PDF version of the Core Rules is included and can be retrieved by a unique code included inside the book.